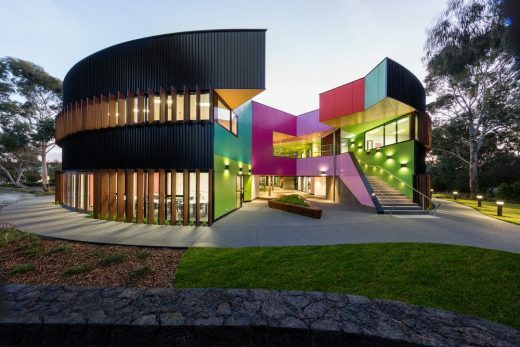 McBride Charles Ryan of Melbourne, Victoria, Australia, has been announced as the winner of the WAN Colour in Architecture Award 2016 for their Ivanhoe Grammar Senior Years & Science Centre, a project that places a vibrant and engaging use of colour at the heart of the design concept. The Cloud House is an addition and renovation to a double-fronted Edwardian house in Fitzroy North. Over the course of close to a century, this house has received several additions and modifications. McBride Charles Ryan’s work for the house is designed in three parts. This allows for a sequence of distinct and unexpected episodes, with glimpses previewing oncoming spaces and experiences as you move through the home. There is a clear hierarchy in this house. Contrasting to the raked timber wall that stretches from the letterbox to become the westerly verandah, the remainder of the house appears as a simple modernist expression akin to many of the houses in the region. On approach, the raked timber wall appears to have morphed from out of the diminutive letterbox. Yet from other perspectives the house appears to have been carved away. March 21, 2017 in Architects.